In 1900, Emily Carr took a course in clay modeling at the Westminster School of Art in London, England, but it was not until 1924 that she began to produce pottery. This same year in Victoria, a demonstration by a local teacher showing the use of blue clay from an area nearby inspired craftspeople, and a flurry of pottery-making ensued. Mrs. Kate Mather, the original owner of these works, operated a gift shop in Banff and wintered in Victoria, staying at Carr’s boarding house in 1924. 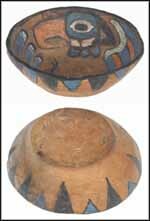 Maria Tippett writes that Mather "asked Emily to make ‘Indian pottery’ for her to sell. Mather's prompting, and the promise of a commercial outlet, gave Emily the impetus she needed to begin.” Carr was eager to supplement her income, as these were lean years for her. To keep her native iconography accurate, she studied artifacts at the National Museum of Canada and consulted books such as John Swanton’s ethnography of the Haida and A.P. Niblack’s Coast Indians, making drawings from them. 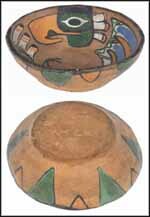 These colourful Klee Wyck bowls show Carr’s enterprising and inventive use of native designs.